Here'Padmabhushan' Smt. 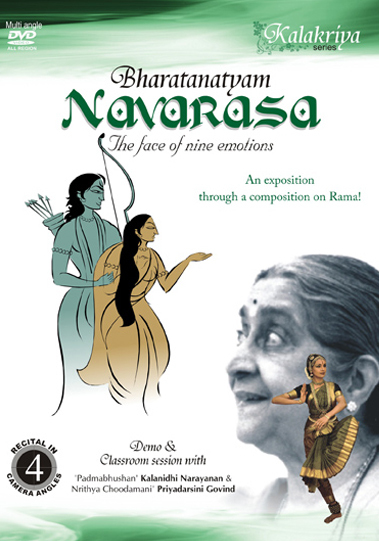 Kalanidhi Narayanan, the legendary abhinaya exponent provides some vignettes in the life of Sri Rama and explains how navarasas,the nine basic emotions described in ancient Bharatanatyam texts, are articulated through them. Aided by her dynamic face and supple hands, she elucidates the exploits and emotions of Rama through an engaging classroom session with her illustrious disciple Priyadarsini Govind. 'Bibatsam' at the very thought of a woman other than Sita. 'Bhayanaka' only at the thought of going against dharma. What follows the classroom session is a sprightly demonstration of 'Srungara Stiti Nandiney' by Priyadarsini Govind. Gear up for an aesthetic voyage with Kalanidhi 'Maami'!